Enjoy this 8 hour experience and get to see two monuments in one time and see some of the best of the Spanish Capital. During this private tour get to know these two very famous sites with your own private official tour guide and be comfortably transferred in your private vehicle with chofer. You will enjoy the Monastery of the Escorial and Madrid’s famous square of the Valley of the Fallen. 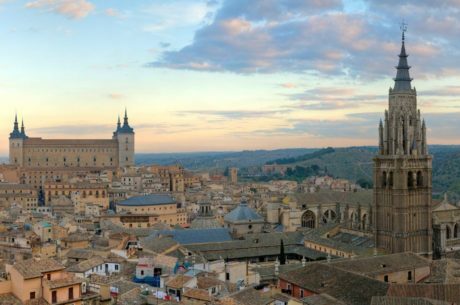 Enjoy this private 8 hour tour with your official your guide and get to know the Escorial Monastery and the Valley of the Fallen very comfortably in your private vehicle with your chofer. The tour will depart from your hotel in the city of Madrid and you will begin to explore Madrid in a quick panoramic tour until you reach your first stop, the Escorial Monastery. The Escorial Monastery is also known as the Royal Monastery of San Lorenzo El Real. It was built in the 16th century by the King Phillip II. Nowdays it hosts a great collection of European Art. Enjoy this private tour with your private guide to get to know the most important information and details of this monastery. You will be able to enjoy some of the pieces of the collection as well as the visit of the Pantheon of Kings and Basilica. After this, the tour will continue towards the Valley of the Fallen. It is very close from the Escorial Monastery and hosts a great historical story. It was erected by the Dictator General Franco and was built as a monument to the dead of the Spanish Civil War. Your private tour includes a guided tour of the basilica as well as the valley itself and you are able to enjoy the extensive views the valley has to offer. When you have finished from visiting this site, your guide and private vehicle with chauffeur will take to towards a panoramic tour of the city of Madrid just before taking you back to your hotel. Your tour is completely personalized to fit your own needs. The tour will be organized taking into account what you want. You can decide which monuments you would want to see in Madrid after enjoying the Valley of the Fallen. When your tour is over, your guide and private vehicle with chauffeur will accompany you back to your hotel or place of choice in Madrid.